The Disney All Star Resort is fun!! With three separately-themed areas, the All Star Resort hosts a huge number of value priced rooms. This hotel appeals to families with children and guests on a budget. Family suites offer affordable accommodations for groups of up to six people.The Disney value resort is a great alternative to staying offsite. Experience the Disney magic 24/7 at a budget price! 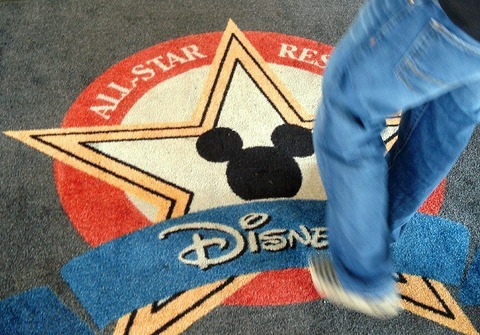 Disney All Star Resort is a Disney value resort offering budget accommodations on Walt Disney World property. The resorts are themed after sports, music and Disney movies with huge icons planted all over the property. The atmosphere is festive, if a bit juvenile. 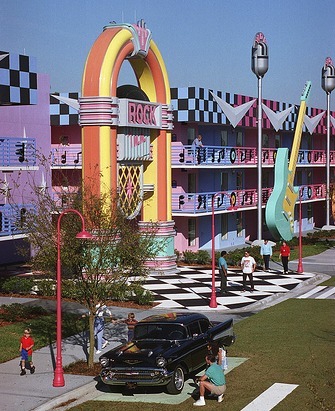 The All Star Resort theming may appeal to boys than some of the other resorts. Each of the Disney All Star Resort areas is comprised of ten buildings. There are 1920 standard-sized rooms at the All Star Resort Sport and Movie complexes. The All Star Music property has 1604 standard rooms and 162 family suites. The hotels resemble motels with rooms opening directly onto exterior corridors on the three story buildings. The All Star Resort standard hotel rooms are 260 square feet (compared to 314 square feet for Disney moderate resorts). Rooms sleep up to four people plus an infant in a crib with either two double beds or a king (upon request). The king rooms are handicapped accessible and have larger bathrooms that further limit the space in the rooms. The rooms can comfortably accommodate small families, but are small and lack a lot of storage. A curtain separates a vanity area from the bedroom area. The vanity area with one sink is located outside the bathroom, which is nice when you are trying to get a family ready for the parks. A mini-fridge is included, but not a coffeemaker. There is a keyed safe in the rooms. 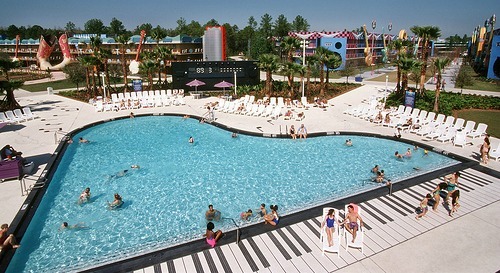 Disney All Star Resort family suites are found in the All Star Music Complex. The family suites can sleep up to six people plus an infant in a crib. All rooms are all non-smoking. The rooms are clean and have good housekeeping. The resorts are noisy and the rooms are not well insulated. Self parking is close to the resort rooms. Disney value resorts have a food court and pool bars, but no sit down dining. The food courts are busy (crazy at times) with average food. McDonald's is located nearby on Disney property. Pizza delivery is available to the rooms. The hotels offer several amenities, mostly located in a centrally located building on each campus. The main building hosts the check in area, arcade and food court. Disney offers bus service to all areas, including theme parks. One bus stop is available at each resort from the main building. Each All Star Disney resort has two pools: one larger better themed and a smaller, quiet pool. Kiddie pools are also available. The pools do not have slides. The resorts also offer nightly movies, playgrounds and a jogging path. If you are looking for a Disney value resort for your family, consider the Disney All Star Resorts. With a fun, family-friendly theme you will have a great time!